Hi Bebe Fetal Doppler / Heart Rate Monitor - BT-200 - Free Shipping! FREE 1/4 liter Tube Ultra Sound Lotion with Purchase! This handy portable fetal doppler detects the fetal heart rate quickly from about 10-12 weeks through labor, and it's safe and simple to use. The new Hi Bebe BT200 hand held fetal heart rate monitor has been designed to be small and lightweight, yet robust, making it ideal for midwives, doctors and of course, pregnant women. The Hi Bebe fetal doppler features an audio speaker, plus a clear LCD display of the fetal heart rate. Not only will the sound of your baby reassure you, but you can bond with your baby from the very beginning. With the built in loudspeaker, you can share the miracle with family and friends. Or use the audio output for earphones to lull yourself to sleep with the sound of your baby's heart beating. The Hi Bebe BT-200 baby fetal monitors come complete with attached probe, batteries and ultrasound transmission gel (everything you need to start monitoring.). Includes 2 x 1.5V (AA) batteries and ultrasound gel -- you're ready to listen as soon as you open the box! Made for Doctors, Easy Enough for Mom! 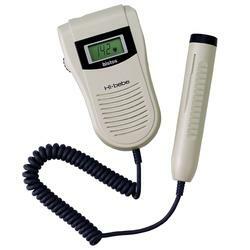 The Hi-Bebe BT-200 is a Pocket Sized Ultrasound Fetal Doppler used to detect the fetal heartbeat. The BT-200 has a comfortably shaped body with a 2MHz cylindrical fetal doppler probe that is held in place with an integrated probe holder, providing excellent protection of the delicate probe. FetalSure® has combined the BT-200 Fetal Doppler's sensitivity and ease of use with FetalSure's unique Resonance Dampening System (RDS) to provide high quality clear sound. Affordable: The HI-Bebe BT-200 Fetal Doppler monitor features state of the art engineering and low cost manufacturing making it extremely affordable without any sacrafice to quality. Doctors, Hospitals, andClinics can easily increase their inventories of fetal dopplers to better assist in patient evaluations without sacrificing quality. Empower your staff to assist in fetal heart detection and diagnosis. 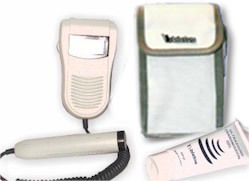 Expecting Motherscan now afford medical quality fetal doppler monitor to use at home. Accurate Heart Rate Display: Hi Bebe BT-200 comes with a large Fetal Heart Rate (FHR) display . The digital readout provides accuracy within ±2% with a range between 50 and 240 beats per minute (bpm). The convenience of the FHR display saves counting and calculating thefetal heart rate adding confidence to the diagnosis while providing visual reassurance for mom. 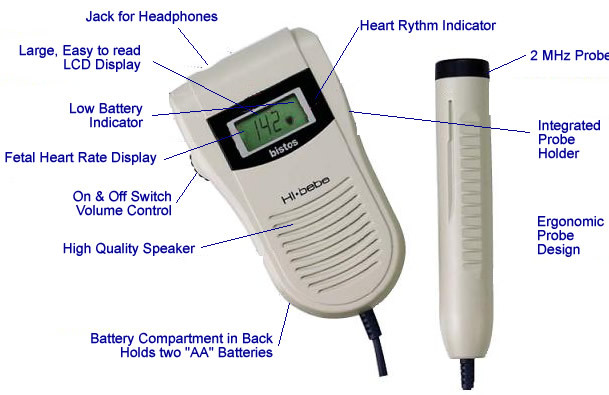 Safe: The Hi Bebe BT-200 Fetal Doppler meets the stringent safety and quality standards required to receive the CE mark and FDA approval for sale in the United States. The Hi Bebe BT-200 Fetal doppler is approved for sale in the United States by the FDA . The Hi Bebe Fetal Doppler has received the CE mark. Not all fetal dopplers being sold are approved by both the CE and the FDA, the Hi Bebe Fetal Doppler is approved by both, you should always ask the seller if their fetal doppler is approved by these organizations before purchasing. Your safety is important and there is no reason to take a chance on buying products that have not been approved by the FDA and received a CE mark. Remember that the Fetal Doppler does not replace the need to monitor the child's progress with a professional caregiverIf you have any concerns about your own health or the health of your child, you should always consult with a physician or other healthcare professional. Parents should not use the Fetal Doppler Heartbeat Monitors in any way for diagnostic or other medical purposes . FetalSure Fetal Doppler Heartbeat Monitors are not intended and should not be used as a substitute for regular prenatal care by medical practitioners. Any concerns about your pregnancy should be addressed to your medical practitioner. FetalSure Fetal Doppler Heartbeat Monitors are provided for home use by expecting mothers with the approval of their medical practitioner. Please discuss the use of the FetalSure Fetal Doppler Heartbeat Monitor with your medical practitioner before purchasing. Currently, the FDA requires a physician's prescription for the sale or rental of Doppler fetal heartbeat monitors. Using a Doppler without physician's supervision is not recommended.